In 2018, a major refurbishment was carried out by Severn Trent Water at the Roundhills STW works, as part of the AMP 6 programme. The main project involved the refurbishment of six of the existing aeration lanes. This required the complete closure of each lane for diffuser cleaning or replacement. As the work was to take place over a number of months, the operating aeration lanes required additional oxygen in order to cope with the works’ flow. Aquasystems International provided 5 x 18.5kW, 3 x 15kW and 2 x 11kW Aqua Turbo® AER-AS floating aerators from its extensive hire fleet. The 10 units were installed in the summer of 2018, together with electrical control panels and cabling all provided by Aquasystems. 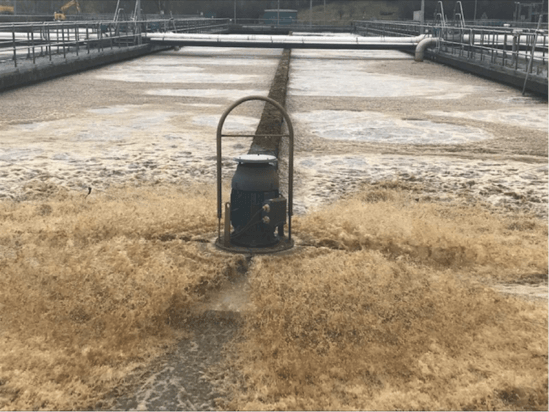 The aerators have been used to support the existing activated sludge plant and the units have been run almost continuously to enhance the existing plant. Additionally, the amount of oxygen provided by the aerators ensured that de-nitrification was minimised, reducing the risk of rising sludge in the settlement tanks. 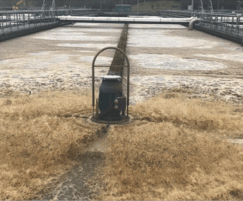 A spokesman for Severn Trent Water commented that the all parties involved were extremely pleased with the performance of Aqua Turbo® floating aerators during this extensive refurbishment programme at The Roundhills Sewage Treatment works. The works has met its consent due to the additional aeration capacity provided by Aquasystems International NV.